My mom use to make seviyan / vermicelli at home with hands for sevaiyan kheer / porridge.In summers she use to make lots of seviyan and dry it in shade and then in sun .the whole year stock of vermicelli was made in summers that time. she always made handmade seviyan for seviyan kheer .well it’s a tedious procedure .Now a day’s roasted as well as non roasted seviyan are available in market. You can take buy both thin and thick vermicelli to make seviyan/ vermicelli kheer. Thin vermicelli cooks very fast .I use thin vermicelli when I make seviyan kheer with condensed milk .Use condensed milk to make seviyan kheer, when you want to make kheer quick otherwise go for slow cooking with whole milk / tonned or skimmed milk (depending upon the amount of calories you want to consume). Well I personally prefer to make kheer with milk and cook it for almost ½ an hour. After eating kheer made from milk you won’t have the heavy feeling, but when the guest comes without intimation then condensed milk works really well for seviyan / vermicelli kheer / porridge . Heat ghee in a pan and roast the vermicelli / seviyan in the ghee ,roast the seviyan till it becomes light brown . (if you r using non roasted seviyan) . if your using roasted seviyan skip this step. Keep milk to boil. When it starts boiling add roasted seviyan to it and let it boil on low flame. Let it cook stirring it frequently. Slowly the milk will start reducing and kheer will become thick. Check the semiyan if it’s cooked or not. It will take around 20 – 25 minutes to get a desired consistency. Once the semiyan are cooked add sugar / sugar free to it. Let it cook for another 5 minutes. Add cardamom powder, saffron, finely chopped pistachios, raisins & roasted almonds & cashew in semiyan kheer and remove it from heat. Serve semiyan/ vermicelli kheer hot or chilled. 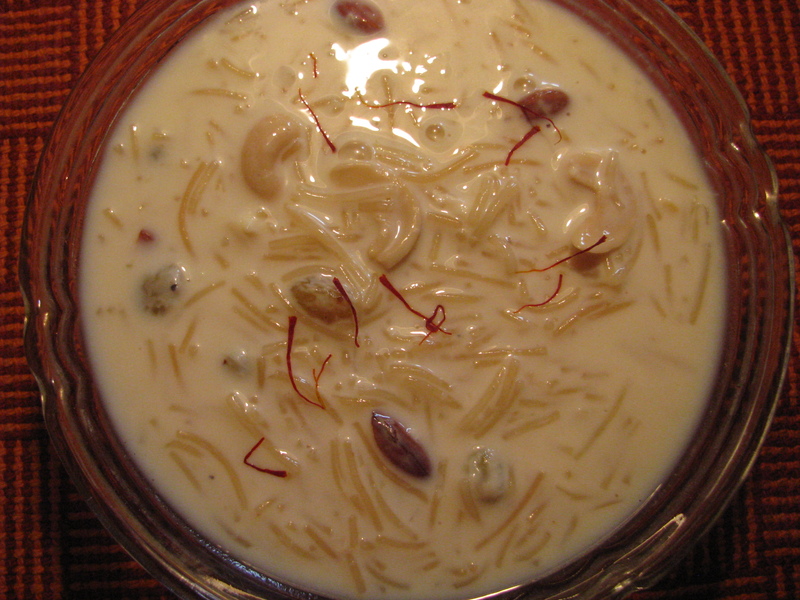 Stir the kheer frequently while its cooking , otherwise it will burn and overflow . Don’t add sugar before the semiyan are cooked it will make your seviyan / vermicelli hard.